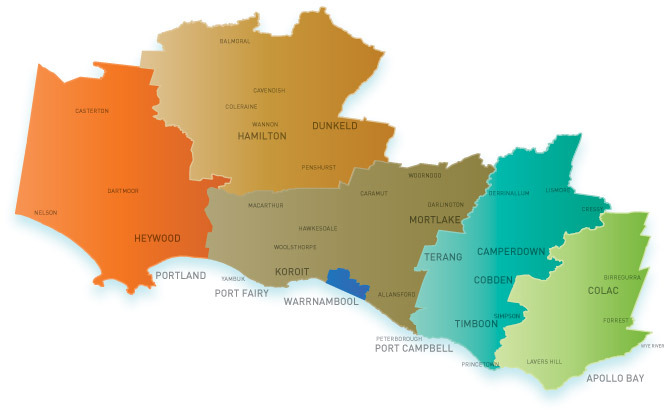 CeRDI in collaborations with Lateral Plains Pty Ltd developed the Great South Coast Digital Strategy to assist local governments in the Great South Coast region of Victoria to identify the potential for digital technologies to contribute to regional growth. In 2016 CeRDI developed the Great South Coast Digital Strategy which culminated in the presentation of the research findings and final report. CeRDI together with Lateral Plains Pty Ltd were contracted by the Regional Development Australia - Barwon South West Committee to develop the digital strategy for the Great South Coast Region. The region comprises the local government areas of Colac Otway Shire, Corangamite Shire, Glenelg Shire, Moyne Shire, Southern Grampians Shire and Warrnambool City Council. The aim of the research was to determine regional business uptake of digital solutions that enhance productivity and profit, the level of digital maturity in businesses and exemplar businesses that are contributing, or have the potential to contribute, to the growth of the region’s economy. CeRDI’s Director, Associate Professor Helen Thompson and Jennifer Corbett worked closely with George Fong, Director of Lateral Plains to prepare the strategy. Surveys and interviews with key stakeholders were conducted to ascertain levels of digital uptake and to talk with businesses that had already established strong digital initiatives. The Great South Coast Digital Strategy provides an overview of the economic and digital technology context for each local government in the Great South Coast region, supported by insights from key business stakeholders. The report highlights many business and technology innovations that are evident across the region and showcases the successful uptake of new technology within traditional industry sectors, such as agriculture and tourism. The strategy also reports on the key issues and challenges for the region and includes recommendations for building stronger linkages between regional goals and local, state and federal government policies. This strategy extends previous research undertaken by CeRDI and Lateral Plains in 2011 for the Great South Coast Communication Strategy, which was undertaken to support the National Broadband Network roll-out in the region. The Great South Coast Digital Strategy report provided the impetus for an implementation strategy workshop/round table in Warrnambool in mid-July 2016. Both Associate Professor Helen Thompson and George Fong presented the findings to delegates at the forum. Establishing the Digital Champions group with major sector and technology leaders to provide leadership and oversight for the Great South Coast Digital Strategy implementation. The methodology used is outlined below. An action plan was developed and recommended, taking into account the local government policy and funding context.